The Bulls pulled off a brilliant and unlikely comeback Saturday, charging back from a 19-point third quarter deficit behind Jimmy Butler for a 123-118 overtime victory over the Toronto Raptors. The Bulls were led by Butler with 42 points, 32 in the second half and overtime. Dwyane Wade had 20 points, Doug McDermott 17 and Nikola Mirotic 12. DeMar DeRozan had 36 for Toronto. It capped off an amazing week for Butler with 52 points against Charlotte and 14 points in the fourth quarter in the win in Cleveland. 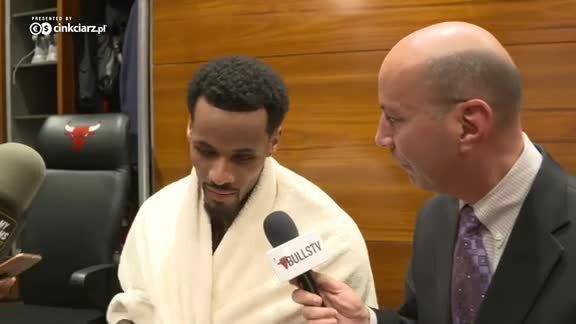 It was the Bulls 10th straight victory over Toronto. The Bulls went to 19-18 while Toronto fell to 24-12. Denzel Valentine remained out with an ankle injury and Rajon Rondo remained out of the rotation. The Bulls came in having won a remarkable nine straight against the Raptors, who come off a conference finals appearance. 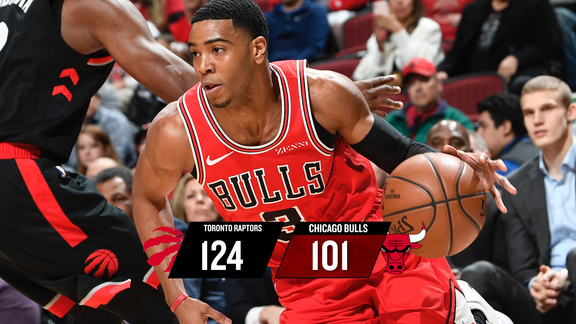 Both teams shot well to start, the Bulls at 57 percent in the first quarter and Toronto at 55 as the Bulls led 29-28, DeRozan leading the Raptors with 10 points. Toronto moved ahead 10-6 and then the Bulls edged back with a 13-12 lead, the teams with eight lead changes and four ties in a back and forth first with all five Bulls starters scoring between four and six points. The Bulls tied it at 34 on a Nikola Mirotic free throw with 9:49 left in the second quarter, and then seemed to lose sight of the swift Raptors. Toronto plays fast, pushing the ball and taking quick shots. They bolted from that tie to take a 50-38 lead with 4:31 left in the first half. The Bulls got it back to 53-45 on a Butler three-point play. But Toronto, scoring 12 first half points on turnovers to four for the Bulls, ran off eight straight points before a Wade three brought the Bulls within 61-48 at halftime. DeRozan had 15 in the half and Wade 13. The Bulls got a good start to the half with a Butler three, but the Raptors kept pushing the ball back and got strong play inside from Jonas Valanciunas to push the Bulls into a timeout with 7:43 left in the third leading 73-56. The Bulls were growing somewhat frustrated with the officiating, resulting in some hard fouls and Raptors marching to the free throw line for 14 free throws in the first nine minutes of the quarter for an 83-65 Toronto lead. The Bulls trailed by as much as 19 in the quarter. 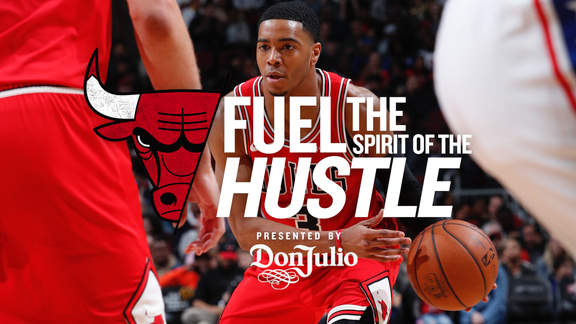 Butler got going late in the quarter, scoring six straight points, four on free throws to enable the Bulls to head into the fourth quarter trailing 86-74. Butler had 15 in the quarter. The Bulls got a lob dunk from Cristiano Felicio and corner three from Mirotic to draw within 10. But they were unable to limit the cross court passing that found Cory Joseph for a pair of threes, enabling the Raptors to maintain a 96-83 lead with 8:28 left in the game. The Bulls continued to come on more aggressively with Felicio on a follow of a Wade miss for a three-point play to get within 99-90 with 5:55 left. It was then Butler down the stretch making big play after big play, scoring nine straight points to get the Bulls into a tie and then rebounding his own miss and getting the ball to Mirotic for a three, hitting Wade for a dunk and getting back another miss for a McDermott three with 39.5 seconds left for a 107-105 Bulls lead. DeRozan tied it with 31.7 seconds left with free throws. After Wade missed and Felicio missed the tip, Toronto had two chances with short jumpers at the end of regulation and missed. In the overtime, the Bulls quickly went ahead on Wade free throws, then two more free throws from Butler and three from McDermott for a 114-111 lead. Kyle Lowry drove it back, but McDermott had a driving slam dunk on a back door cut after a Butler pass and a big step back three from Butler with 17.3 seconds left for a 121-116 lead.